Meatloaf. Herb-roasted chicken and acorn squash. Korean beef and rice. Black bean nachos. Shredded potato cheddar soup. Peruvian purple potato gnocchi. Think you can’t get a good meal at a donate-what-you-can cafe? Then go eat at Thelma’s Kitchen at 31st Street and Troost Avenue in Kansas City, Missouri. There, diners can get those or other items from a menu that changes daily -- a full meal of entree, soup, salad, dessert and a drink for whatever they are willing to pay. The suggested donation: $7 for a small plate and $10 for a large, but many pay more and others less. If you’re strapped for cash, you can even buy a meal with a half-hour of helping out in the cafe. Though the food is a clear draw (the shredded potato cheddar soup was recently named one of Kansas City’s best soups for 2019) what Thelma’s is really serving is community. 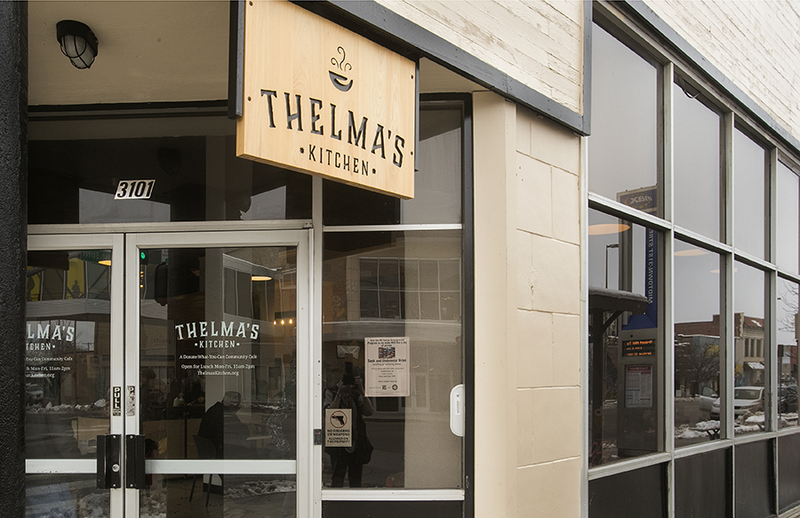 Since it opened last summer, Thelma’s has become a popular gathering spot, a place where people from all walks of life sit and have lunch together. 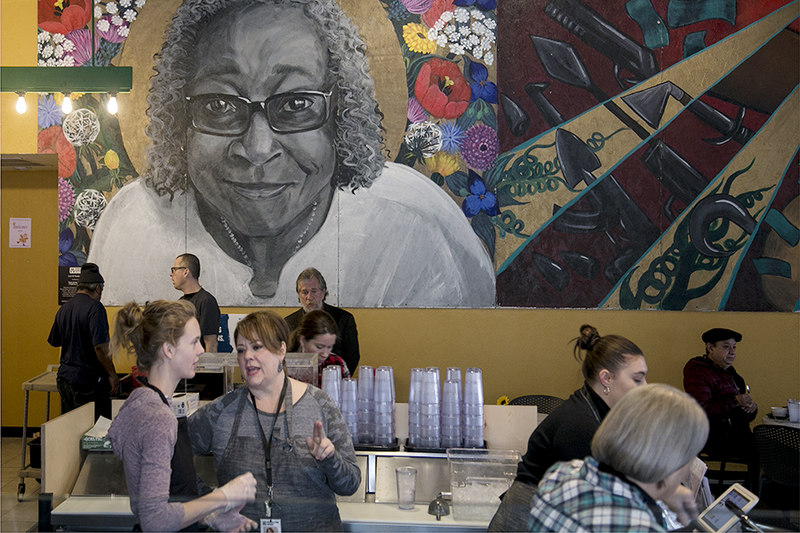 The image of the late Thelma Gardner, a co-founder of Reconciliation Services, watches over diners at the cafe that bears her name, Thelma's Kitchen. Part of a larger program aimed at reconciliation and community building, Thelma’s Kitchen is operated by Reconciliation Services, a faith-based nonprofit founded by St. Mary of Egypt Orthodox Church. 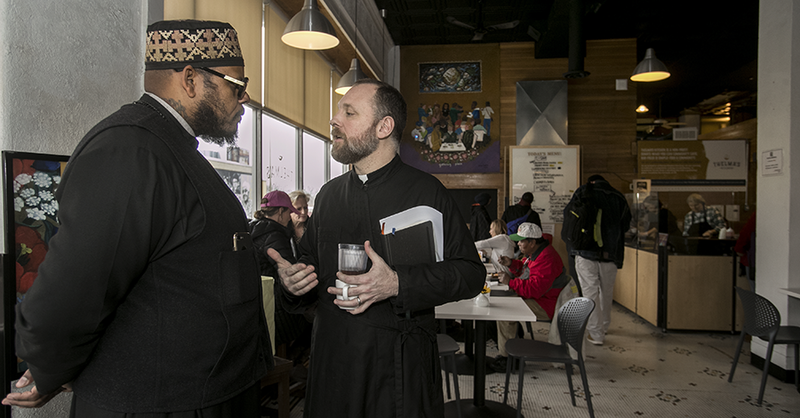 With a distinctly Orthodox Christian approach to mission, Reconciliation Services offers outreach programs and classes, social services, medical support, mental health services and community-building initiatives to one of Kansas City’s most economically troubled neighborhoods. All three -- nonprofit, church and restaurant -- are housed in a four-story building that Reconciliation Services owns at 31st and Troost, church on the top floor, Thelma’s on the bottom, and Reconciliation Services mostly in between. Troost Avenue has been a racial dividing line for generations, a boundary between Kansas City’s white residents and black residents, between those who have enough and those who don’t. Overall, 99 percent of Reconciliation’s clients live below the federal poverty line, 79 percent are black, and more than half have been victims of violence. “There has never been a time in the history of Kansas City when Troost was not the dividing line,” said the Rev. Justin Mathews, the executive director of Reconciliation Services and one of two priests at St. Mary of Egypt. Thelma's Kitchen, located at 31st and Troost Avenue, is open for lunch 11 a.m.-2 p.m., Monday through Friday. Racial division, Mathews said, began in the early 1800s, when the first white settlers forced the Osage out of the area. Later, slaves worked for decades on a plantation that sprawled across what is now the Troost area. In what ways are people divided in your community and city? Where are the dividing lines and boundaries? Though the neighborhood went on to experience ups and downs, he said, deadly riots after the assassination of Martin Luther King Jr. in April 1968 marked the beginning of the area’s recent decline. Even today, as redevelopment and gentrification bring new pressures to the neighborhood and its residents, that legacy of trauma still shapes Reconciliation Services’ approach to ministry. 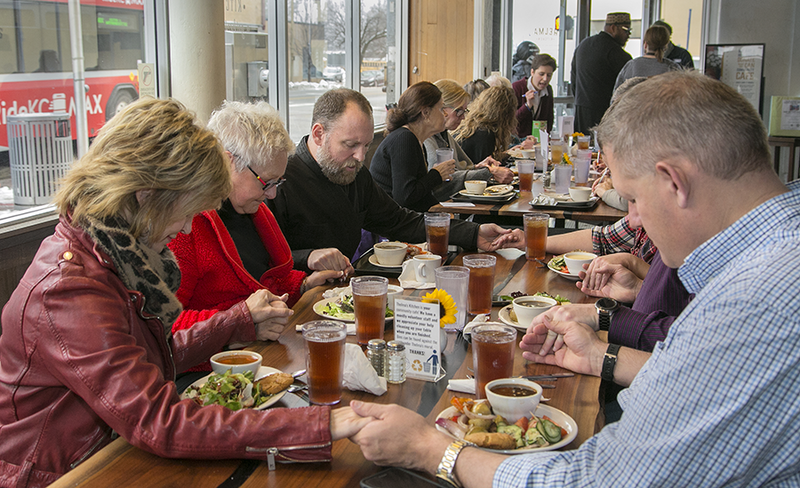 Mathews, third from left, offers a blessing before a lunch meeting at Thelma's Kitchen. How has history shaped your community? How does your church’s ministry reflect that history? For years, American churches have launched nonprofit organizations to help carry out their social justice ministries, but Reconciliation Services took a very different path. It began as essentially a one-person house ministry, which begat a church, which in turn launched the formal nonprofit. Reconciliation Services traces its roots to the 1980s, when the cafe’s namesake, Thelma Gardner, a black woman who had grown up poor in Texarkana, Arkansas, started her own social justice ministry, working from her apartment in the Troost area to do what she could to care for her neighbors. David Altschul and Thelma Gardner. A few years later, she met David Altschul, a successful, white insurance salesman 12 years her junior, who also felt called to help and feed families in the neighborhood. After the two married in 1987 over the objections of family and friends, they founded a loose-knit organization, Reconciliation Ministries, in the building at 31st and Troost, offering hot meals and assistance as best they could to anyone in need. As their work in the neighborhood intensified, the two began reading and studying the Desert Fathers and Desert Mothers, along with other early Christian writers, and soon found themselves increasingly drawn to Orthodox Christianity. “Their journey was so powerful, they became the mother and father of this part of Troost,” Mathews said. Eventually, the small community at Reconciliation Ministries became St. Mary of Egypt Orthodox Church, and after study and preparation, Altschul became its priest. At his ordination, he took the name Father Paisius, and Thelma became Matushka (a title for a priest’s wife) Michaela, after the archangel Michael, her patron saint. In 2005, when Father Paisius completed a master’s degree in social work, the church relaunched Reconciliation Services as a separate nonprofit. After Matushka Michaela died in 2012, Father Paisius became a monastic, taking the name Hieromonk Alexii and founding a monastery in rural Missouri. Their story is still very much a part of life at both the church and the nonprofit, said Mathews, who succeeded Altschul at the church and nonprofit. The Rev. Turbo Qualls (left) visits with Mathews at Thelma's Kitchen. What lessons does Thelma and David’s story offer for your church? 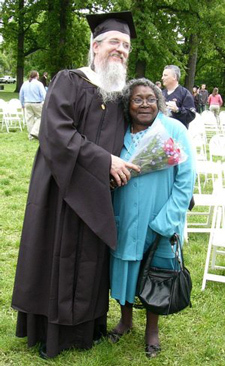 “Father Alexii and Thelma -- their marriage and suffering as an interracial couple -- was the forge that formed the DNA of Reconciliation Services,” he said. Today, St. Mary of Egypt, which started with about 50 people, draws about 130 in worship. Known for its multicultural congregation, the church last year brought on a second priest, the Rev. Turbo Qualls, to assist Mathews. This year, the two will gradually reverse those roles, as Mathews begins focusing almost exclusively on leading Reconciliation Services. The change in pastoral duties, Mathews said, is prompted by the tremendous growth that Reconciliation Services has experienced in recent years. Today, the nonprofit’s budget is $2.5 million, up from $600,000 just five years ago. The organization offers mental health services, job training, rent and utilities assistance, and vouchers to help pay for prescriptions, medical supplies, vision care and dentistry. 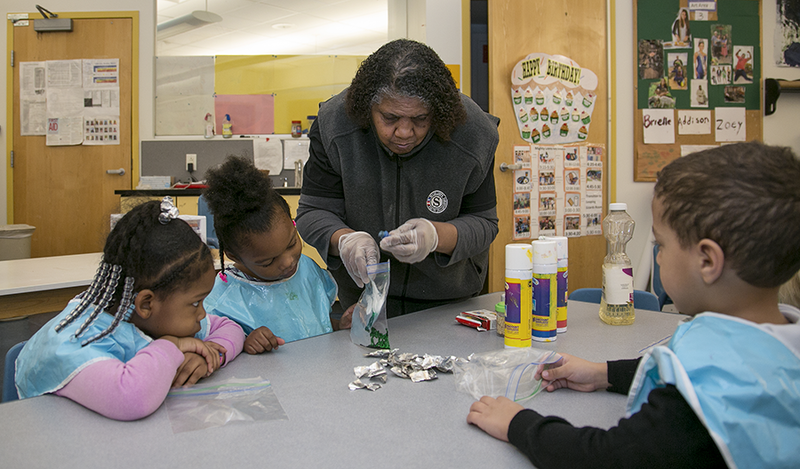 In the Reconciliation Services foster grandparents program, low-income volunteers 55 and older mentor at-risk youth; last year, 92 foster grandparents logged 80,000 volunteer hours. Janet Foy is one of many people who have been helped by Reconciliation Services. Now 58, she came to Kansas City in 2005 from Nashville, Tennessee, with nothing but her bag. Unemployed and broke, she was chronically ill, and not long after she arrived, her mother died. “I felt like a shoe in a dryer,” she said. As Foy tried to rebuild her life, she was repeatedly stymied by a single roadblock. She had no identification -- no driver’s license, birth certificate or any other form of ID, an absolute necessity for anyone seeking a job and self-sufficiency. Missouri, like most states, charges for the documents that unlock the door to help; no ID, no help. Low-income victims of theft or fire and others who have been evicted or are homeless face the same hurdle. Before long, Reconciliation Services helped Foy get her birth certificate, opening her path to a new job and a new life. Last year, Reconciliation Services case workers helped clients secure more than 1,500 IDs and other documents needed to qualify for employment and benefits assistance. As she looked for a job, the Reconciliation Services staff provided help and encouragement. Foy signed up for a workshop that led to an internship at a local Humana insurance office, where she works today. Foy said that Reconciliation Services is effective because the staff includes people who have known the emotional and financial pitfalls of life. Mathews and the staff understand the Troost community, its history and its people, she said. 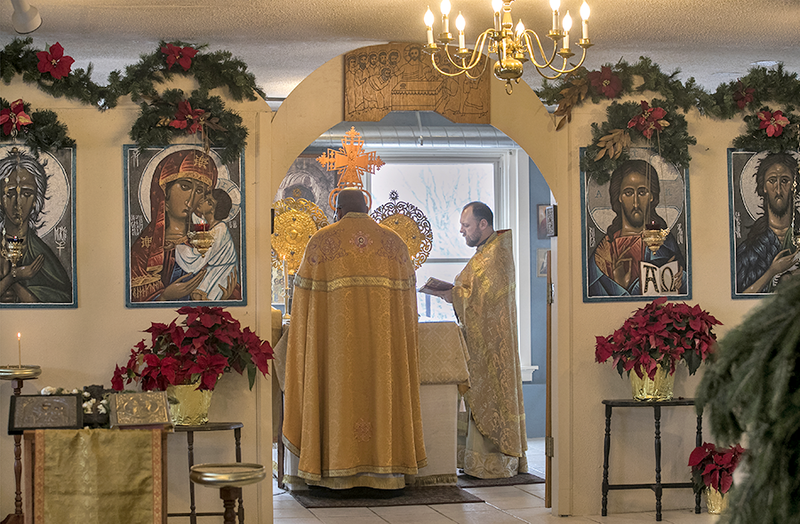 What connects all of Reconciliation Services’ work, shaping and informing the organization and its approach to ministry, is Orthodox Christianity. At Reconciliation Services, Orthodox sacramental theology intersects directly with the work of alleviating poverty, Mathews said. Mathews encourages his staff -- some paid, some volunteers, some Christian, some not -- to “love them [clients] till they wonder why.” Everyone they encounter -- clients, donors, volunteers, staff -- is an icon, he reminds them, an image of God. Qualls and Mathews stand at the altar during Sunday worship at St. Mary of Egypt Orthodox Christian Church. How does your church’s outreach ministry reflect its theology? Mathews is the first to acknowledge he’s not a typical Orthodox priest. Formerly a full-time musician who played guitar, sang in Christian groups and worked as a sound technician, he had a religious awakening while living in Nashville that put him on the path to the Orthodox faith and seminary. He earned a business degree before going to seminary, and that background influences how he approaches his work at Reconciliation Services, which sits right at the intersection of business, faith and philanthropy. Mathews views himself as an entrepreneur in ministry, reading and writing on social entrepreneurship, equitable design thinking and disruptive innovation for social good. St. Mary of Egypt and Reconciliation Services offer a model for the broader church, he said. Reconciliation Services is a nonprofit that is able to do “works of mercy” in an ecumenical way with a wide variety of people, he said, sharing the love of God and at the same time generating funds to support operations. Mathews prefers instead to end the problems that Reconciliation Services encounters, not just offer temporary solutions. The core issue in Troost, as Altschul recognized years ago, is trauma, Mathews said. A mural across the street from the Reconciliation Services building pays tribute to the history of the Troost neighborhood in Kansas City, Missouri. “And in this community, the source of trauma is bound up in racism, disinvestment and discrimination,” he said. To help residents recover from the damage inflicted by violence and poverty, Altschul became a licensed clinical trauma specialist and offered free clinical therapy for the community. That work still continues at Reconciliation Services, with the nonprofit providing more than 1,400 hours of therapy for trauma and depression last year alone. Today, redevelopment and gentrification are bringing new challenges to Troost Avenue. As more black residents move to the west and south in Kansas City, white residents are returning to older areas in the city center. Only a few blocks down the street from Reconciliation Services, new apartment buildings are going up and older buildings are being renovated and repurposed. 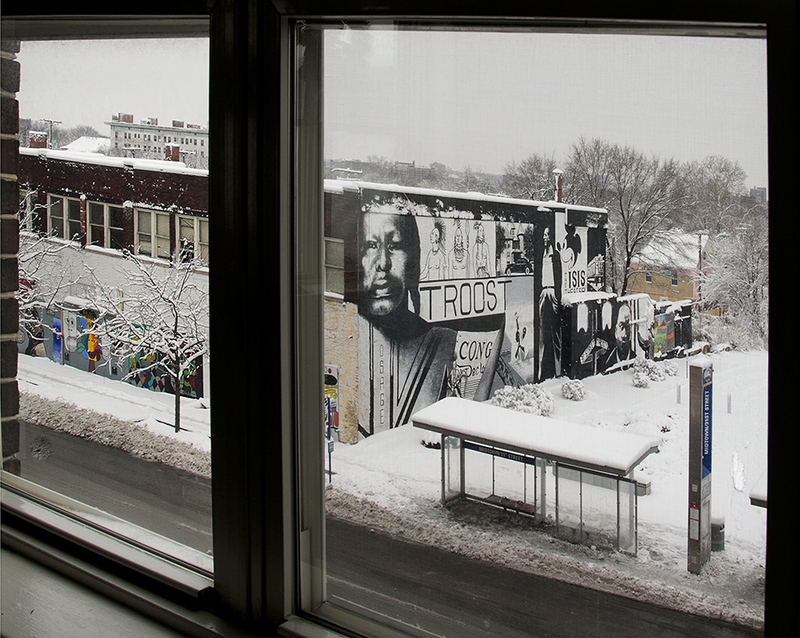 As redevelopment changes the face of Troost Avenue, Mathews has become a visible presence in local media, reminding anyone who will listen that need still exists in the neighborhood. “It is good to address the blight of the buildings, but if we do not address the blight of the heart that created the conditions for poverty in the first place, we aren’t changing anything,” he said. Where does the neighborhood see signs of your church's commitment and presence? In the face of change and redevelopment, St. Mary of Egypt, Reconciliation Services and Thelma’s Kitchen are determined to stay right where they are, in the building at 31st and Troost. In many ways, opening Thelma’s Kitchen last summer was a “stake in the ground,” a sign to the neighborhood that Reconciliation Services is not going away, Mathews said. Where has your church planted “a stake in the ground?” Where does the neighborhood see signs of the church's presence?